Peter Grunberg, a Nobel-Prize-winning physicist who discovered how to store vast amounts of data by manipulating the magnetic and electrical fields of thin layers of atoms, making possible devices such as the iPad and the smartphone, has died at 78. His death on April 7 in Julich, Germany, was announced by the Juelich Research Centre, where he was a long-time researcher. Dr. Grunberg shared the Nobel Prize in physics in 2007 with Albert Fert of the Université Paris-Sud in Orsay. They had independently made the same discovery – of an effect known as giant magnetoresistance, in which tiny changes in a magnetic field can result in huge changes in electrical resistance. The effect is at the heart of modern gadgets that record music, video or other data as dense magnetic patchworks of ones and zeros – that is to say, electronic tablets and smartphones, the GPS devices in our pockets and handbags. Peter Andreas Grunberg was born on May 18, 1939, in Pilsen, in what is now the Czech Republic. His father, Theodore, was a mechanical engineer who designed locomotives. The elder Grunberg died in a Czech prison camp in 1945. Subsequently, Peter, an older sister and their mother, Anna, were expelled to Lauterbach in western Germany. Dr. Grunberg entered Wolfgang Goethe University in Frankfurt in 1959. In 1963, he entered the Darmstadt University of Technology, emerging with a PhD in physics in 1969. He married Helma Prauser, a future teacher he had met in 1966, during his studies in Frankfurt. They had a son, Andreas; two daughters, Sylvia and Katharina; and two granddaughters. There was no immediate information on who he leaves. After his postdoctoral fellowship, Dr. Grunberg joined the Institute of Solid State Research at the Juelich Research Centre, near Cologne, and stayed there until he retired in 2004. Engineers have been recording information magnetically and reading it out electrically since the dawn of the computer age, but as they have endeavored to pack more and more data onto their machines, they have been forced to use smaller and fainter magnetic inscriptions and thus more and more sensitive read-out devices. Since British physicist Lord Kelvin first wrote about the subject in 1857, it had long been known that magnetic fields could affect the electrical resistance of magnetic materials such as iron. Current flowed more easily along the field lines than across them. While this effect on electrical resistance was useful for sensing magnetic fields and, in electronic heads, reading magnetic disks, it amounted to only a small change in the resistance and physicists did not think there were many prospects for improvement. So it was a surprise in 1988 when groups led by Dr. Fert at the Laboratoire de Physique des Solides in Paris and by Dr. Grunberg found that super-slim sandwiches of iron and chromium that they had assembled showed large sensitivity to magnetic fields – or “giant magnetoresistance,” as Dr. Fert called it. The name stuck. The reason for the effect has to do with what physicists call the spin of electrons – their somewhat mysterious ability to have an orientation in space. When the magnetic layers of the sandwich have both their fields pointing in the same direction, electrons whose spin points along that direction can migrate freely through the sandwich. Electrons that point in another direction, however, are scattered. If, however, one of the magnetic layers is perturbed by, say, reading a small signal, it can flip its direction so that its field runs opposite to the other one; this dramatically increases the electrical resistance of the sandwich. Experts said the discovery was one of the first triumphs of the new field of nanotechnology, the ability to build and manipulate assemblies of atoms only a nanometer (a billionth of a metre) in size. The scanning heads in today’s electronic devices consist of alternating layers – each only a few atoms thick – of a magnetic metal such as iron and a nonmagnetic metal such as chromium. At that minuscule size, the strange rules of quantum mechanics come into play and novel properties emerge. 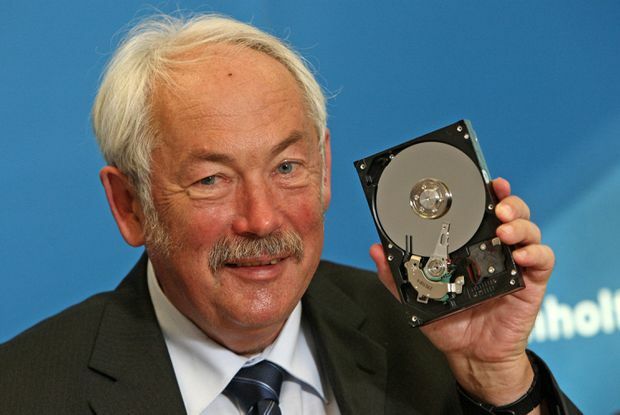 As a result, Dr. Grunberg’s work laid the foundation for a new, even smaller and denser type of memory storage called “spintronics.” Here, information is stored and processed by manipulating the spins of electrons, with applications ranging from videotape to MP3 players and hard disks. The announcement of this effect, at a meeting in Le Creusot, France, caused a sensation in high-tech circles. The discovery allowed computers and other devices to greatly increase the amount of data they could store. By the late 1990s, according to a report in Physics World, the rate of increase of hard-disk data storage had tripled. The world of big data was on its way. When he was awarded what some observers called the “iPod Nobel,” Dr. Grunberg said he was not surprised because he had been asked many times over the years when he was going to win the big prize. In his Nobel autobiography, he recalled that it was only at the Le Creusot meeting that he finally met Dr. Fert, with whom he would share the Nobel. The rivals got along great.